From the Warp: What do you use for black and white? What do you use for black and white? I've often wondered what is the preferred paint choice when it comes to the two basic colors, black and white. Being the mercenary painter that I am, I'll use any brand that works and I have no loyalty to any one particular paint. When I first started painting, I used craft paints. The cheap stuff. I had no issues with them either. It wasn't until I had a chance to try some other brands that I realized what I was using was not the "best" stuff out there. I eventually picked up some Skull White and found that to be much better than the previous craft paint I was using. I still have not bought the official GW black paint. To be honest, I don't even know what it's called in the new paint range. I haven't changed my paints (at least black and white) for the longest time. It wasn't until recently that I had the opportunity to pick up both a black and white from Army Painter. Even though I'm not a big fan of the dropper bottles, I wanted to see what else was out there. Compared to the black craft paint I've been using for years which has worked perfectly for me to date, I really like the Army Painter black. Despite the fact that is has an almost satin look to it sometimes, it's got wonderful coverage and the paint is super smooth. When I add a tiny bit of water, I can paint super-fine details and black line things without worry. It's made working with black a real pleasure now. I mean it wasn't bad before, but this is such an improvement. And even though it looks satin under some light, it still blends perfectly with my black spray primer. When it comes to the white, I like the Army Painter white a little better than the GW version. Again it's for the smoothness. It seems to cover slightly better as well and not break up as bad when I thin it with water. And so I'm left wondering, what are the "best" black and white out there? I was happy with my craft paints for the longest time. Then I moved up to GW Skull White and found it to be an improvement. Now I have the pair of paints from Army Painter and I love them. I'm looking for a paint that is super smooth, covers well and holds together when thinned with water. The Army Painter colors do that very well, but I'm not against trying something else. I have no idea if you can get it in the US though, but definitely worth looking for. It thins nicely without losing coverage, and it gives a nice matt finish. It also works well as a wash when heavily watered down (I use it as much as Nuln oil at the moment) and it's an absolute bargain for the price. I've only ever really used GW Skull White, and recently Ceramite White, both have "done the job" and not much more - coverage not great, and I still have the odd issue with getting a smooth coat. Andy Walker: Interesting... looks like regular artist acrylic paint you might use in art school. You say you have no trouble thinning it down either? I've got some of the same black paint that Andy has, I tend to use mine for scenery. I've also thinned it down to paint over polystyrene so I can they spray over it. Not used it on miniatures before but one of my friends swears by it and always under coats his minis (by hand the fool!) with it. I'm finding the very same Joy with army painter black Ron, I manage to get the starter set for £19 recently I guess that's about $35 give or take. Really impressed and the brushes are excellent also. "Being the mercenary painter that I am, I'll use any brand that works and I have no loyalty to any one particular paint." Hah, love it. As for my choices of black and white, I've always used the GW Chaos Black and Skull White, but since both are running out I've opted to try out some things from the P3 line, including their Thamar Black and Morrow White. It just got shipped yesterday, so I'm eager to try them out sometime soon. I hear P3 stuff has good coverage and thins well, but I'm not sure that extends to their white. Also Ron, I'd like to mention that on your previous post regarding replacements for Badab Black/Devlan Mud washes, I too have ordered some Army Painter Strong, Dark and Soft Tone inks. Can't wait to try those out too. 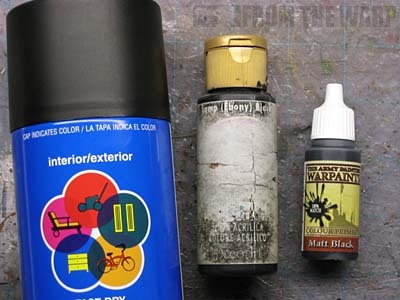 I use both old GW pots (still kicking around from 89-90), and Vallejo Game Colors. I really like the consistency of Vallejo out of the bottle. I haven't found a white I really like, having tried two different GWs a craft paint and the VGC one. Maybe whites are all awful. I have got a lot of mileage out of some of the P3 off whites - Menoth White Highlight especially. In terms of blacks, the best I've tried by a country mile is the p3 one. It dries nice and matte, which makes it a truer black to me - at least. ieuan: I have a few more AP colors myself that I'm getting into. I've already found the best brushes for me, but their paints have consistently impressed me recently. Steelshanks: Their replacements for Badab Black and Devlan mud are spot on in my opinion. Gonewild: There's a brand I don;t have much experience with. I think maybe because I don't have them around me. Other brands are easily available near me. Fentible: I love P3 Menoth White Highlight myself I use it as a warm white highlight all the time. For Black: Vallejo Heavy Charcoal or Black Grey (same colour, really), with a bit of black wash or black ink. In other situations, P3 Coal Black with some thinned ink added. Depends on the effect really, as Coal Black has a bit more of a green hue to it, whereas the Vallejos have a slight tint of blue. For white, it depends on cool or warm. Warm: Vallejo Ivory. Cool: P3 Underbelly Blue and then glazed up with Vallejo White Glaze. I honestly can't say the last time I cracked open the "pure black" pot, and only use Ceramite White really as an undercoating at times for the lighter colours or the most extreme highlight on top of the Ivory or Underbelly. I'm a Reaper Fanboy, so I use their Pure Black and Pure White from the Master Series line exclusively. It works well for me. Thinnable without losing pigments, and smooth application. Sound silly but Ron check out Martha Stewart craft paints. Will Wright: Martha Stewart... seriously? I would not have guessed that paint range in a hundred years. Reaper master series is pretty good. I tend to use a lot of citadel myself, but I've had the chance to use reapers master series a few times and it's nice. They have a range of whites but I haven't tried them all - linen white is decent and so is leather white. Their pure black is smooth. My favorite black so far is Delta Ceramcoat black. I've tried other craft paints and GW black, but this is my favorite (and really inexpensive). As for white, the Delta one isn't all that great, but the GW ones I've use have been good, but I wouldn't be against trying some others when mine run out. cpyke: That was my go to black as well for the longest time. It wasn't until I got hooked on the AP black that I made the switch over. Anon: I have a Joann Fabrics near me. I may have to give it a go. I use the Chaos Black/Skull White Sprays, Chaos Black out of the pot (don't have the new stuff, but really like the coverage of the old stuff.) I wasn't ever really a fan of Skull White, but I am a HUGE fan of the new Ceramite White, which seems to behave differently than Skull White on the brush. My favorite spray used to be Armory Black primer, but they don't stock it anymore at my game store. Hey! We use the same black spray paint! And so does everyone else with a Walmart within driving distance because it's only 96 cents! As far as I've been concerned, black paint is black paint. 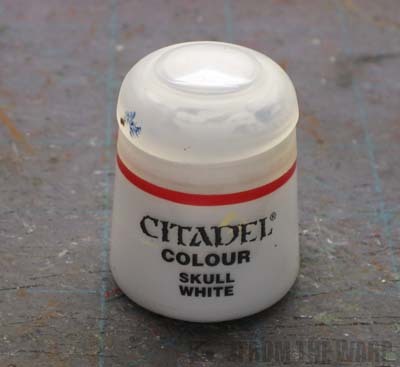 One day, I hope to transition completely away from the Citadel paint range. The new range is crummy at best. For white, I couldn't beat the (now) old Dheneb Stone Foundation paint with a two thin coats of Skull White over top of it. Although considering that I'm quickly running out of Dheneb Stone, I may end up purchasing more TAP Warpaints sooner than I thought! I covered it in a post a while back, but I've found that pigments create a great effect when doing black. I still have GW Skull white and chaos black :/ I guess i dont paint as much as i'd like. Its handy to get some perspective on other brands for when i eventually run out. Radical Edward: I haven't used the new Ceramite White myself, but I hear more good things about it than bad. Myles: I love that spray paint. It works perfectly for me and I can't think of any times I ever had trouble with it. Dave G: I missed that one, thanks for sharing the link! Very cool stuff there especially with the blending into black. Murray Boyton: That was my thought too. See what others were using for the basics. It's always cool to see what else is out there and even better when you pick up a new trick or paint to use. For black I use Vallejo Model Colour German Grey, followed by a black wash, highlight with the original colour then final highlights (if required) with a mid-grey. For white, I use Vallejo Silver Grey, which looks white to the naked eye until you highlight it with an actual white. Generally, I give the Silver Grey a wash (light brown/sepia for clothing, black or a very oily dark brown for ceramic, armour etc), highlight with Silver Grey then final highlights with white. Lead Legion: I like that... you've got a system down for exactly what you want to paint depending on what it is on the model. I keep hearing folks mention Vallejo Model Colour German Grey too. Must be a nice color to use for black. I use it a lot too - it's that dark grey shade that always seems to have been missing from the GW range, and as it's Vallejo it's nice to work with too. Now where is that delete comment option again? As for white it really depends on the overall colour scheme, maybe a yellowish white, a blueish white or a greish white and like the black, blend it so that pure white is the highest light. I like the idea of using prussian blue. 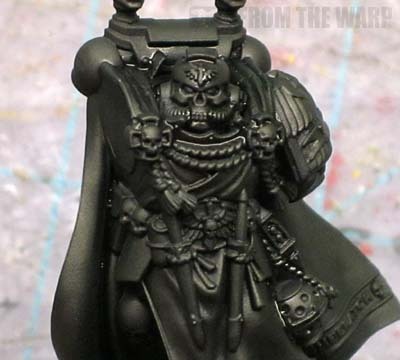 This article just reminded me of what I have forgotten to order, my 10 year old black and white GW paints need replacing and I am about to embark on a Black Templars army. I have been nursing an Ork army for the last 20 years and so rarely used black and white before now other than from a spray can. I am really loving the army painter spray paints since getting into scenery so have started picking up the matching pots of war paints. Bit annoyed that GW stopped making the Foundation paint range & washes but their entire line up being remade has made me start looking at others equally. The quality of the Army Painter stuff was noticeable. Nostok: I know what you mean. There are lots of other quality paint lines out there. I too am really starting to branch out more from the standard GW range. I used to not use any GW paints. Then I started with some of them and now I find myself looking for alternatives in some cases.